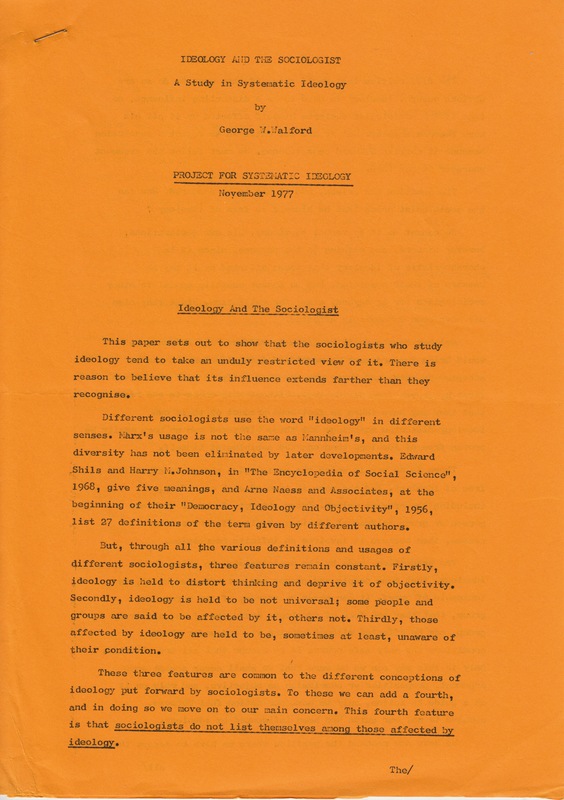 George Walford: Ideology and the Sociologist, A Study in Systematic Ideology. This paper sets out to show that the sociologists who study ideology tend to take an unduly restricted view of it. There is reason to believe that its influence extends farther than they recognise. Different sociologists use the word “ideology” in different senses. Marx’s usage is not the same as Mannheim’s, and this diversity has not been eliminated by later developments. Edward Shils and Harry N. Johnson, in The Encyclopedia of Social Science, 1968, give five meanings, and Arne Naess and Associates, at the beginning of their Democracy, Ideology and Objectivity, 1956, list 27 definitions of the term given by different authors. But, through all the various definitions and usage of different sociologists, three features remain constant. Firstly, ideology is held to distort thinking and deprive it of objectivity. Secondly, ideology is held to be not universal; some people and groups are said to be affected by it, others not. Thirdly, those affected by ideology are held to be, sometimes at least, unaware of their condition. These three features are common to the different conceptions of ideology put forward by sociologists. To these we can add a fourth, and in doing so we move to our main concern. This fourth feature is that sociologists do not list themselves among those affected by ideology. The difficulties that would arise if they were to do so are obvious enough. Ideology is held to be a distorting influence, so that if the sociologist declares himself affected by it all his work becomes suspect. But we are not entitled to reject a conclusion because it carries awkward consequences. We must follow the argument wherever it may lead. The question has arisen, and it has to be answered: How can the sociologist prove that he himself is free of ideology? He cannot do it by verbal testimony. His own declarations, however sincere, are nothing to this purpose, since it is characteristic of ideology that those affected by it may be unaware of their condition. And he cannot usefully appeal to other sociologists (or to anybody else) for validation, since they also may have been unknowingly affected. Neither can he do it by the factual evidence. Any evidence he would bring forward must be certified factual before it can be accepted as such, and those who are to certify it must themselves first be proven free of ideology. Without this there is the risk that they may have taken as fact some product of their own ideology-distorted thinking. But these witnesses can no more easily be proven free of ideology than can the sociologist himself. There is no way in which the sociologist can prove himself free of ideology. And the same is true of each one of us, including the present writer. Every attempt, to prove that any person or group is free of ideology, fails. If for not other reason, then because it involves an infinite regression. The assumption, made by the sociologists who write about ideology, that some people and groups are not affected by it, is incapable of proof. It can never be proven, of any person or group, that they are free of ideology. Every one of us, and every group, may be affected without knowing it, and under these conditions the only safe course is to assume that all are affected. Only in this way can we be sure that we shall never accept some argument, proposition or conclusion as objective, and rely on it as a guide to action, only to have our action fail because, unknown to us, our guide had been influenced by ideology. We have now reached the position where we have to accept that all of us, not only the subject of sociological study but also the sociologist himself – and, of course, also the present writer – are, or may be, under the influence of ideology. It is an uncomfortable position and, at least so long as it is unfamiliar, it can also be worrying. How can it be possible to produce valid sociological work under these conditions? How, in fact, can it be possible to carry on any rational activity at all? But we soon see that our worst apprehensions are unfounded. The world does not dissolve into chaos around us. For, after all, Newton did not invent gravity, and we have not just now invented ideology. Neither have we just now universalised its influence. All we have done is to recognise a pre-existing situation. Our understanding has changed, but the world around us remains much as it was. Human achievements remain, and in doing so they hold out the promise that our situation is not as dark as we may think. For we now recognise that these achievements are the work of men influenced by ideology. The men who built our civilisation, the men who created science, philosophy, art and literature were, all of them, subject to ideology. If they could work, and work successfully, under this influence, then so can we. The difference will be that we shall be (to an extent determined by our understanding of ideology) aware of our situation. 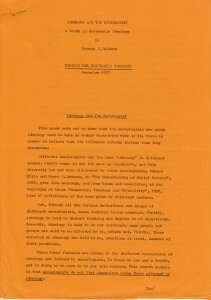 We shall have to encounter a host of new problems (it is for the study of these that the Project for Systematic Ideology has been set up) but we may also expect to reach new solutions, solutions to difficulties, arising from the universal influence of ideology, whose source had not previously been recognised. One final point. This paper has been written in impersonal style, but it is meant to carry personal impact. I recognise that I am affected by ideology and I say that you, now reading these words, are also affected by it. Do you deny this? If so, then, bearing in mind that those influenced by ideology may be unaware of their condition, how to you support your denial? The Social Science Association Introduces Democratic Union «» George Walford: Ideology, Autonomous or Epiphenomenal?